The impact of cash transfer programming on children’s well-being must be considered at all stages of the project cycle. Child protection or child safeguarding must be considered in all cash transfer programming, irrespective of the sector in which it is being used. 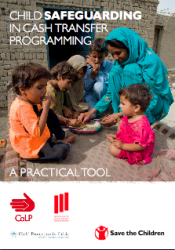 This tool, which resulted from a collaboration between Save the Children, the Cash Learning Partnership, and the CPC Learning Network’s Livelihoods and Economic Strengthening Task Force, enables programmers to make their cash transfer programming more accountable to children, by providing guidance on how to prevent and respond to child protection incidents more effectively.